AMERICAN FREEDOM by BARBARA: Demand for Union Transparency and Choice on the Rise! Demand for Union Transparency and Choice on the Rise! The Devil at Our Doorstep and blogs such as Rank and File Union Membership Post Victories, SEIU Watch and Michigan Kickoff are committed to publicizing the stories of employees across the nation that have been impacted by, or are taking steps to fight back against, Big Labor’s control tactics of forced unionism and forced dues. Much of these “membership” dues are utilized for political purposes instead of for the benefit of the membership. The Devil at Our Doorstep has long published the story of “Mariam the Mighty,” an immigrant from Egypt, now working for the state of California’s Department of Motor vehicles (DMV). As a member of a state agency, she is required to have membership in the Service Employees International Union (SEIU). Mariam has expressed her concern that unions were the primary downfall of her home country and she did not want to see the same thing happen in the United States of America! Subsequently, she started a movement against the union, Occupy SEIU, and is committed to having the SEIU Exposed! 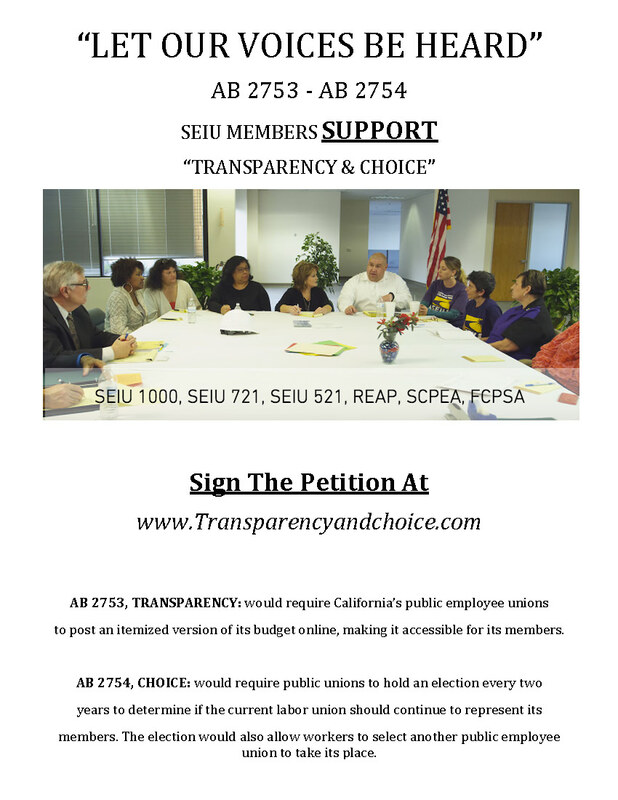 Mariam’s latest movement is titled “Transparency and Choice,” and it is an effort to require California’s public employee unions to post an itemized version of its budget and financials online, making it accessible to the membership. Additionally, the proposal would require public unions to hold an election every two years to determine if the current labor union should continue to represent the membership or allow workers to select another public employee union to takes its place if they wanted to remain unionized. It is apparent that public employees in California are fed up with the union monopoly and Want Change Now. California Assemblywoman Shannon Grove is Supporting Mariam and her Coalition in achieving their objectives and in limiting the political power that unions have in the state of California. Mariam’s coalition hopes to obtain 1 Million signatures by March 31, 2016 by having members go to the web site www.TransparencyAndChoice.com and sign the petition! Once again union members are intent on the Big Labor Racket Being Exposed! They realize Big Labor is not in business for the membership, but rather to Collect Money for its Political Interests. I sincerely hope that all who read this blog will help Mariam and her coalition achieve their objective of having these bills passed by spreading the word on their efforts, and getting the media to bring public attention to their cause. After all, this is just the beginning of California moving towards becoming a “Right to Work” state, which the majority of states now have implemented into law. For more information, read Big Labor’s Rollercoaster of Emotions and Public Unions on the Precipice!, chronicling public unions’ desperate attempts to maintain forced unionism and dues to keep the Democratic Party in place and avoid the demise of public sector unions. Shannon Grove Pushes Plan to Make Unions More Accountable to its Members! It is imperative that we bring attention to causes like those of Mariam! Together we can eliminate the SEIU's Persuasion of Power and bring forth “Right to Work” to protect employees across the country and make America great again! Please help make this happen by signing the petition at www.TransparencyAndChoice.com!